Bruce was born in Perth Scotland 1961 and on leaving Perth Grammar School in 1977 served an apprenticeship as a fabricator/welder which he continued to work at until 1984. 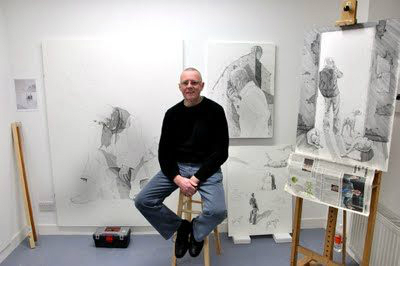 He then worked as an airframe technician until 2003 when he then left to go back and study art as a mature student, firstly an NC Fine Art at ‘Dundee College of Further Education’ and then BA/Hon’s Fine Art at ‘Duncan of Jordanstone College of Art, Dundee University’, graduating in 2009. Bruce now works as a self employed artist, from’ WASPS Studios Meadowmill Dundee’ ,producing commissions and artworks for exhibition and sale in various galleries. He also tutors/facilitates art workshops and classes within the community for ‘Perth and Kinross Council’ the NHS and leisure classes at ‘Perth College’. Working mainly in the graphic media of drawing and printmaking, his work can vary from narrative images of crumbling buildings, lined faces and a variety of creatures to evoke a sense of mystery and tell their own stories in a manner that is sometimes surreal yet familiar, to a fascination with the landscape its’ own sense of time atmosphere and place ‘genius loci’ and our place and effect on it. RSW 138th Open Annual Exhibition, RSA Galleries, Edinburgh. Colin Dakers Memorial Award, The Meffan Forfar, Winter Show 2018.